If you’ve got lots of music files with incomplete or missing artist, album, or song tags, and you want to spare yourself the time of figuring out what those tags should be, SongGenie can help tidy up your music library. The program analyzes all your tracks using “acoustic fingerprints” to compare them with information in the online MusicIP database, which contains some 8 million tracks (and apparently works with MusicBrainz.org), to find missing tags or discrepancies. To use SongGenie, first you load your music library into the program. You can choose, in the program’s preferences, if you have specific paths where you store music; otherwise, the program will look in your Music folder inside your home directory. This process can take a while if you have a lot of music: About twenty songs load per second at first, but this slows down as more tracks get loaded. If you have a large library, I recommend setting it to load when you aren’t planning to check your tracks (see below)—in my testing, it took several hours to load my 38,000-track library on a quad-core Mac Pro. After the initial loading, subsequent launches of SongGenie are much faster. To check tracks, you select one or more and then choose Analysis: Identify Song (or press Command-return). SongGenie checks the selected tracks with MusicIP and compares what it finds with the tags on the files on your hard drive. If the results differ, blue “result arrows” display next to the song, artist, and/or album name. Click on an arrow to apply that tag to your version of the track; click on the Apply button to apply all tags; or click on Ignore to ignore the potential changes. When SongGenie finds a track that may appear on several albums (for example, the original album, a best-of compilation, and a soundtrack), the program displays a number in the Album arrow; clicking on this number pops up a menu of possible albums for you to choose from. Sometimes you’ll find that suggested changes are as minimal as differences in capitalization or abbreviations, but even these changes can be useful: If you tag your files using Gracenote, the online database that iTunes uses to grab track info when you rip a CD, SongGenie can help you standardize or improve those tags. Like the process of loading your music, checking tracks for missing data is slow, as well as processor-intensive, although you can similarly choose to check all tracks at once; for example, overnight when you’re not using your Mac. For many tracks, SongGenie works well, although in my tests—with an admittedly eclectic music library—SongGenie didn’t find information for much of my untagged or imperfectly tagged music, and at times even told me that correctly tagged music was missing information. 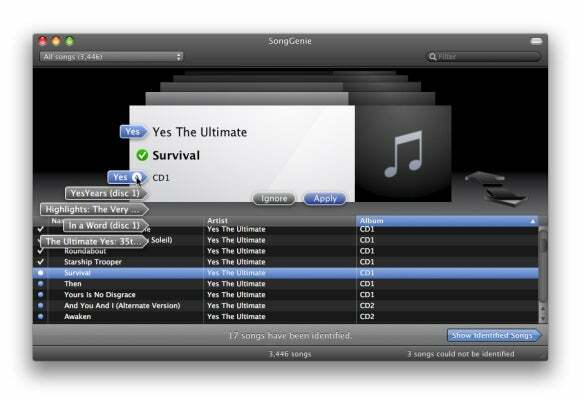 In most of the latter cases, SongGenie displayed the existing (correct) tag information in spite of designating that information as “missing.” And on a half-dozen or so tracks, SongGenie displayed the existing-information fields as empty even though those same tags display correctly in iTunes. SongGenie also found a number of tracks where the song name and artist were available, but the album was listed as “Unknown album” without any suggestion that there was missing information. Similarly, SongGenie found tags for only a tiny amount of my classical music; when it did find such info, sometimes it was for only a few tracks per album, and the data was often less than optimal. SongGenie lets you choose which album tag you want to apply to a track when a song is found on multiple albums. You also shouldn’t act too quickly to accept every suggested change. In some cases, the information it offers may be misspelled or use incorrect capitalization. For example, for an album by Sigur Ros, SongGenie wanted to “fix” the correct Icelandic spelling of certain track titles. And SongGenie sometimes offers to fix track titles by capitalizing the word “the,” while other times suggests lower case. It’s worth noting that most of these issues aren’t the fault of SongGenie itself; there is clearly a lack of coherence in the MusicIP database. Another shortcoming of MusicIP is that its database contains mostly music released on CD; although SongGenie did find a few tracks from live concerts I’d downloaded, don’t count on SongGenie to help you tag lots of live music distributed over the ‘net. As for SongGenie itself, it would be useful to be able to drag a folder of audio tracks onto the program to have just those files checked; currently, if you want to avoid reprocessing previously-inspected folders, you must go into SongGenie’s preferences, uncheck those folders, and then add the new folder. I also wish you could remove songs from the list of all songs, so you don’t have to see them once they’ve been checked (though you can access lists of songs that have missing information, that have not yet been checked, or that have already been checked). Overall, SongGenie performs as advertised, but since it depends on the MusicIP database, it can find only what’s available in that database. It is probably most-useful for those who have a lot of music that was not, say, checked against the Gracenote database that iTunes uses at the time of ripping, although it can also help if, like me, you’ve discovered that Gracenote’s user-submitted track data is less accurate than you’d like. At a minimum, it can help you correct capitalization and spelling errors, and may improve some tags that are erroneous. At best, if you have a lot of music without tag information, or with incorrect tags, SongGenie can save you the trouble of finding the correct information, as well as the time it takes to enter that information by hand. Just don’t expect miracles.